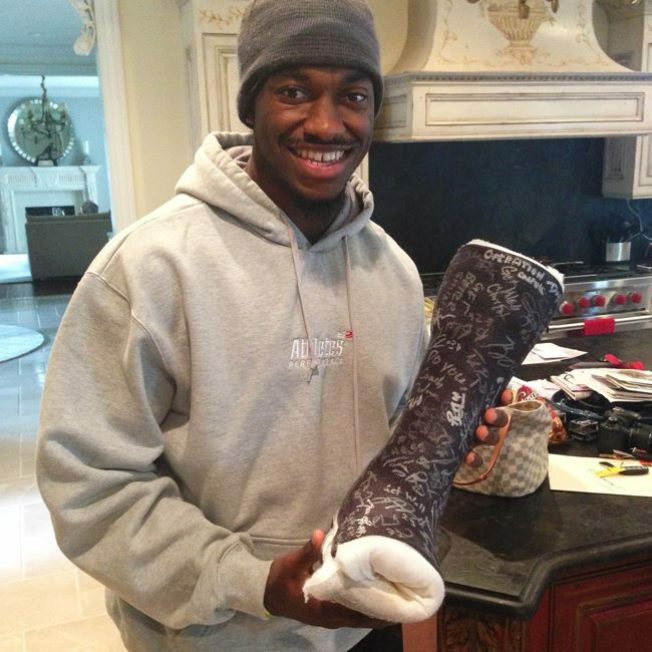 Robert Griffin III recently put the cast he wore on his dislocated left ankle last season up for auction, with the proceeds benefitting his Family Of 3 foundation. That auction just ended, with the winning bid of $1,522 placed by Rich Bruno, coincidentally a podiatry student at Temple University. 19 months ago, I enrolled in podiatry school. At that moment, what I loved most in life was the Redskins. They’re still a huge part of me. As time has gone on though, my life has been consumed by feet, and I have loved every second of it. I love feet. I love podiatry. I love the thought of making a difference in so many people’s lives. I am also a huge RGIII supporter. When he had the misfortune of dislocating his ankle, I initially fell to the fetal position and sobbed. A lot. Then, I realized something. All of my loves in life had combined into a singular moment. I squealed like a school girl thinking about how one day, maybe I could be that specialist a player sees. It makes me want to be my very best. The fates decided to have RGIII auction off that cast, and while I will now be liquidating everything I own to pay for it, I own that cast. I own that moment forever. I could not be happier. CARRY ON FOR PODIATRY AND HAIL TO THE REDSKINS!